WASHINGTON (PAI) – Registered nurses from California to Maine will hold strikes, picketing, and other actions November 12 in 12 U.S. states and the District of Columbia – with possible support actions globally – as the largest U.S. organization of nurses steps up the demand for tougher Ebola safety precautions in the nation’s hospitals. U.S. hospitals will not adequately protect their workers – nurses and doctors — against exposure to the dangerous Ebola virus unless the federal government, through a presidential order or an act of Congress, orders them to do so, a leader of a top registered nurses union says. And that lack of protection not only endangers medical professionals, but other people who could later come in contact with an infected person, warns Deborah Burger, co-president of National Nurses United. “The only effective way to stop the spread of fear” of Ebola, as well as its danger, “is to ensure full preparedness in every U.S. hospital. And our long experience with U.S. hospitals is they will not act on their own to secure the highest standards of protection without a specific directive from our federal authorities,” she told lawmakers. Burger told an October 24 hearing of the House Oversight and Government Reform Committee that 3,000 nurses nationwide reported to NNU their hospitals are under-prepared to confront Ebola, the often-fatal virus now epidemic in several western African nations. Citing data from that survey, Burger revealed 68 percent of hospitals have no policy for dealing with Ebola patients, and 84 percent provided no education to their nurses. Almost half lack various protective equipment. She said the feds should set standards in all those areas. “We know that unless uniform optimal standards are universally required for all health care facilities, we are putting registered nurses, physicians and other healthcare workers at extreme and unnecessary risk,” Burger warned. Since Ebola broke out in the African nations-where it has hit so many health care workers that it’s now named “nurse killer” – it has spread to isolated individuals in the U.S. They include patient Thomas Duncan, who died, in a Dallas hospital, RNs Amber Vinson and Nina Pham, who treated Duncan, a nurse in Maine and a doctor in New York. In particular, Burger said CDC gave hospitals the option of equipping nurses with fluid-resistant gowns rather than head-to-toe HazMat suits. CDC also told hospitals to provide protective equipment and suits to doctors and nurses “based on availability,” Burger said. 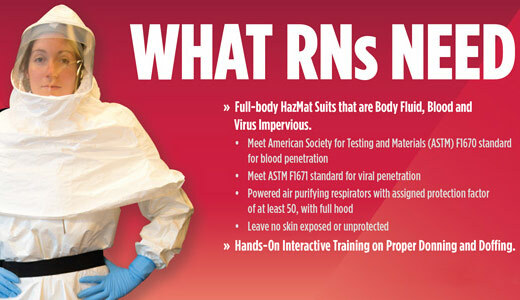 NNU recommended the government order hospitals to furnish hazmat suits and other top-line personal protective equipment, set up procedures and wards to isolate Ebola patients, and mandate frequent disposal of linens and pillows from those wards, as Ebola’s effects include vomiting, uncontrolled diarrhea and emissions of body fluids that carry the virus. But the hospitals won’t carry out those moves, and others, unless Congress or the Obama administration order them to act, Burger declared. Indeed, one Florida hospital not only refused to undertake such measures, but also disciplined a nurse who complained about the lack of information and protective equipment, she testified. “In southern California, a patient claiming Ebola infection presented at an ER where there had been no prior Ebola training and no appropriate personal protective equipment,” such as hazmat suits. Congress or the administration must also act to prevent “fear and panic” about Ebola from spreading throughout the U.S., Burger said. “Simply put – not one more nurse, not one more hospital worker, not one more patient should become infected with Ebola. Not one more community should have fear of Ebola being spread in their neighborhoods.